Immaculate's Taylor Mascetta crosses the finish line in the 1600 meter run during SWC Indoor Track and Field Championship action in New Haven, Conn., on Saturday Feb. 2, 2019. The Weston track program has been a model for consistency in the SWC and the bar appears to have been raised even higher after Saturday night. The Trojans girls won the first, last and several events in between en route to their seventh straight SWC championship at the Floyd Little Athletic Center. The boys also collected the hardware for their third straight time. Coach Matt Medve has to make ample room in his school’s trophy case, because once again the Trojans swept the competition. “Every year is different and every year you get a different mix of kids,” Medve said. “They just keep working hard, just like every other team does. Indoor track is about middle distance and you need to be deep in middle distance to have success in indoor track. The girls team won the SWC indoor championship by just five points a year ago, but left little doubt this time around. Weston won with 117 points, 44 ahead of second-place Newtown. Immaculate was third (52), Pomperaug finished fourth (36) and Brookfield was fifth (31). Newtown’s girls have won the last two outdoor titles while the Trojans have repaid the favor the following indoor season. Weston’s dominance was no more seen in the 600, when the school placed four of the top five finishers. The Trojans won the 4×200 and 4×400 and sprint medley relays with underclassmen contributing throughout the lineup. Ava Zielinski won the 1,000 while Julia Rosenberg won the 600. The Trojans also had three of the top four finishers in the pole vault as Elise Russell won with 11 feet, 0 inches. In addition to winning the high jump, Greene was on the 4×2 team. Nighthawks senior Carly Swierbut set a meet record in winning the 300 (40.78); this came after winning the 55 dash and running the last leg of the opening 4×200. Taylor Mascetta roared to a dominating win in the 1,600, crossing the line in 5:12.82. One of the standouts of the meet, Mascetta took second in the 3,200 and helped the Mustangs to a win in the 4×800, an event Immaculate took second at the State Open last outdoor season. Barlow freshman Mariella Schweitzler won the long jump (16-10.00) and finished second in the 55 hurdles, a race that was won by Pomperaug’s Isabella Azar Brandes (8.72). Panthers teammate Kelsey Savoy won the shot put with a throw of 30-11.00. The boys won by a point more than the girls did, scoring 110 to finish 45 ahead of runner-up New Milford (65). Masuk (64) was a point behind in third while Immaculate (50) and Bethel (41.50) finished in the top five. The middle-distance runners notched points up and down the board for Weston as it won three of four relays and Tobey Bill won the 1,000. Goodman won the 300 in 36.26, just ahead of Masuk’s Connor Mahony (36.91). New Milford senior Eli Nahom finished his college plans by committing to the University of Tennessee last month, and began his indoor swan song by winning the 1,600 and 3,200 Saturday. He won the 1,600 in 4:36.67 while taking the 3,2000 in 9:55.33. Christ N’Dabian won the 55 dash in 6.68 for Bunnell while New Fairfield’s David Murphy won the pole vault (13-00.00). One of the tightest races took place in the 600 as Barlow’s Jeremy Saluzzi overtook New Fairfield’s Jerold Lambert and won by just .08 seconds. Immaculate’s Spencer Brown won the long jump (21-01.50) and took second in the high jump (5-10.00). The senior is after the long jump school record of 21-09, a number he hit last outdoor season. The state class meets begin next week; Class S starts Thursday, Class L takes place Friday and LL and M are Saturday back at the FLAC. 1. Weston 110, 2. New Milford 65; 3. Masuk 64; 4. Immaculate 50; 5. Bethel 41.50; 6. Bunnell 30; 7. Brookfield 28; 8. New Fairfield 25; 9. Newtown 23; 10. Pomperaug 17; 11. Barlow 10.50. 12. Stratford 1. 4×200: 1. Masuk (Steven Lee, Aidan McShane, Christopher Tilotson, Conor Mahony) 1:34.62); 2. Weston (John Cassol, Andrew Oleynick, Aidan Kyle, Baruch Goodman) 1:34.90; 3. Pomperaug (Max Bruno, Mark Cristino, Aidan Markward, Ryan Karp) 1:36.02; 4. New Milford (Matthew Bouzakis, Andre Vial, Nolan Freeman, Luke Chastain) 1:37.99. 4×800: 1. Weston (Blake Braun, Matt Lagana, Matt Scott, Kevin Crowley) 8:43.34; 2. Immaculate (Parker McKenzie, Ryan McNerney, James Sullivan, Allen Riego De Dios) 8:48.43; 3. Newtown (Justin Halmose, Evan Hildenbrand, Matthew Sortino, Nicholas Jacobs) 8:56.04; 4. Bethel (Xander Goodwin, Ryan Dudley, Luca Cazzaniga, Robert Doyle) 8:59.56. 55 hurdles: 1. Aidan McShane (Masuk) 7.86; 2. Adam Aponte (Bethel) 8.19; 3. John Cassol (Weston) 8.31; 4. Isaiah Roberson (Masuk) 8.42; 5. John Macfarlane (Masuk) 8.50; 6. Thomas Hartley (Newtown) 8.58. 55 dash: 1. Christ N’Dabian (Bunnell) 6.614; 2. Conor Mahony (Masuk) 6.620; 3. Alex Mosely (Bunnell) 6.73; 4. Marquise Lawrence (Bunnell) 6.77; 5. Spencer Brown (Immaculate) 6.79; 6. Steven Lee (Masuk) 6.92. 1,000: 1. Tobey Bill (Weston) 2:39.90; 2. Jadon Parris (Brookfield) 2:41.85; 3. Jason Golembeski (New Milford) 2:42.52; 4. Brad Bornn (Bethel) 2:44.73; 5. Evan Gallagher (Bethel) 2:45.38; 6. Colby Cox (Brookfield) 2:49.26. 600: 1. Jeremy Saluzzi (Barlow) 1:25.72; 2. Jerold Lambert (New Fairfield) 1:25.80; 3. Aidan Kyle (Weston) 1:27.26; 4. Jonathan Bell (Bethel) 1:27.97; 5. Schyler Parris (Brookfield) 1:29.07; 6. Shawn Sato (Bethel) 1:29.66. 1,600: 1. Eli Nahom (New Milford) 4:36.67; 2. James Sullivan (Immaculate) 4:42.37; 3. Daniel Finck (Brookfield) 4:44.61; 4. Garred Farrell (New Milford) 4:47.74; 5. Ryan McNerney (Immaculate) 4:47.96; 6. David Finck (Brookfield) 4:49.68. 300: 1. Baruch Goodman (Weston) 36.26; 2. Connor Mahony (Masuk) 36.91; 3. Aidan Markward (Pomperaug) 37.08; 4. Mark Cristino (Pomperaug) 37.42; 5. Christ N’Dabian (Bunnell) 37.55; 6. Aidan McShane (Masuk) 37.80. 3,200: 1. Eli Nahom (New Milford) 9:55.33; 2. Drew Mitchell (Immaculate) 10:14.56; 3. Garred Farrell (New Milford) 10:19.50; 4. Justin Halmose (Newtown) 10:20.77; 5. Robert Harkin (New Milford) 10:21.24; 6. Robert Doyle (Bethel) 10:24.66. 4×400: 1. Weston (Tobey Bill, Aidan Kyle, Matt Scott, Baruch Goodman) 3:34.86; 2. New Milford (Jonathan Tarbet, Andre Vial, Luke Chastain, Jesse Meadows III) 3:40.64; 3. Bethel (Jonathan Bell, Brad Bornn, Shawn Sato, Adam Aponte) 3:43.09; 4. New Fairfield (Lucas Fontes, Devin Krauss, Ralph Lagerman, Jarold Lambert) 3:47.87. Sprint medley: 1. Weston (Andrew Oleynick, George Oleynick, Tobey Bill, Matt Lagana) 3:49.85; 2. Brookfield (Karl Henke, Seth Quattro, Jadon Parris, Schyler Parris) 3:53.29; 3. New Milford (Andre Vial, Luke Chastain, Matthew Bouzakis, Jason Golembowski) 3:55.35; 4. Immaculate (Alex Werdann, Abdel Razeq, Ross Relator, Allen Riego De Dios) 3:57.42. Shot put: 1. Matthew Resnick (Masuk) 41-07.75; 2. Dean Pallas (Bethel) 41-01.75; 3. James Day (New Milford) 40-07.25; 4. Robert Carroll (Newtown) 39-01.25; 5. Connor McRedmond (Brookfield) 38-07.00; 6. Grant Baker (Newtown) 37-00.50. Long jump: 1. Spencer Brown (Immaculate) 21-01.50; 2. Jesone Khantikone (Bunnell) 19-11.00; 3. Vaughn Campos (Weston) 19-09.25; 4. Matt Bigelow (Weston) 19-04.75; 5. John Cassol (Weston) 19-01.25; 6. Alec Llerena (New Milford) 18-11.75. Pole vault: 1. David Murphy (New Fairfield) 13-00.00; 2. Vaughn Campos (Weston) 12-06.00; 3. Matt Bigelow (Weston) 12-00.00; 4. Chris Lewis (Weston) 11-06.00; 5. Connor Nordmann (Bethel) 11-00.00; 5. Sam Edwards (Newtown) 11-00.00. High jump: 1. Dylan Torok (Masuk) 6-00.00; 2. Spencer Brown (Immaculate) 5-10.00; 3. Elliot Netviner (Weston) 5-10.00; 4. Vaughn Campos (Weston) 5-06.00; 5. Dominic Kentish (New Fairfield) 5-04.00; 6. Aiden Jasinski (Newtown) 5-04.00; 6. Jeremy Saluzzi (Barlow) 5-04.00. 1. Weston 117; 2. Newtown 73; 3. Immaculate 52; 4. Pomperaug 36; 5. Brookfield 31; 6. New Milford 29; 7. Bunnell 28; 8. Barlow 23.50; 9. Masuk 22; 10. Bethel 21; 11. New Fairfield 18.50; 12. Stratford 14. 4×200: 1. Weston (Elise Russell, Lauren Bigelow, Nicole Sztachelski, Hannah Greene) 1:49.69; 2. Newtown (Brianna Lovely, Victoria Moran, Amelia Daly, Carly Swierbut) 1:50.72; 3. Bunnell (Kaylah Phommachanh, Kesiri Gonzales, Dardielle Exantus, Abagail Williams) 1:52.35; 4. Stratford (Anekwe Chi Chi, Kelly Goddard, Ava Buckmir, Elle Moshier) 1:52.67. 4×800: 1. Immaculate (Kayla Ondy, Molly Coyle, Ailene Doherty, Taylor Mascetta) 9:40.63; 2. New Milford (Cassidy Ranno, Brooke Morabito, Claire Daniels, Shannon Palmer) 9:58.60; 3. Newtown (Olivia Hage, Emily Tressler, Sophia Guevara, Ally McCarthy) 10:05.30; 4. Weston (Natalie Haythorn, Lianne Saussy, Abby Miles, Sana Khan) 10:09.74. 55 hurdles: 1. Isabella Azar-Brandes (Pomperaug) 8.72; 2. Mariella Schweitzer (Barlow) 8.80; 3. Samantha Pomperoy (New Fairfield) 9.21; 4. Abigail Williams (Bunnell) 9.44; 5. Audrey Benson (Newtown) 9.50; 6. Grace Stephens (Masuk) 9.56. 55 dash: 1. Carly Swierbut (Newtown) 7.37; 2. Kesiri Gonzales (Bunnell) 7.51; 3. Elise Barricelli (Newtown) 7.64; 4. Brianna Lovely (Newtown) 7.70; 5. Kaylah Phommachanh (Bunnell) 7.74; 6. Mariella Schweitzer (Barlow) 7.75. 1,000: 1. Ava Zielinski (Weston) 3:08.00; 2. Michelle Gutowski (Weston) 3:10.62; 3. Charlotte Brehmer (Pomperaug) 3:15.35; 4. Juliet Bussell (Brookfield) 3:16.41; 5. Ava Graham (Bethel) 3:19.88; 6. Shannon Palmer (New Milford) 3:20.55. 600: 1. Julia Rosenberg (Weston) 1:40.16; 2. Nicole Sztachelski (Weston) 1:42.24; 3. Ally McCarthy (Newtown) 1:43.33; 4. Sana Khan (Weston) 1:46.61; 5. Lianne Saussy (Weston) 1:47.51; 6. Cassidy Ranno (New Milford) 1:47.95. 1,600: 1. Taylor Mascetta (Immaculate) 5:12.82; 2. Claire Daniels (New Milford) 5:18.79; 3. Ailene Doherty (Immaculate) 5:21.75; 4. Kayla Ondy (Immaculate) 5:32.69; 5. Samantha Ruggiero (New Fairfield) 5:33.52; 6. Hazel Hudson (New Fairfield) 5:36.54. Sprint medley: 1. Weston (Aiden Kreitler, Abby Miles, Ava Zielinski, Julia Rosenberg) 4:25.38; 2. Newtown (Brianna Lovely, Victoria Moran, Elise Barricelli, Ally McCarthy) 4:30.76. 3. Bethel (Zoe Graham, Perri Englund, Abigail Correard, Nicole Popham) 4:41.19; 4. Immaculate (Madison Flamme, Eduarda Colares, Maura Murphy, Molly Coyle) 4:44.66. 300: 1. Carly Swierbut (Newtown) 40.78; 2. Elle Moshier (Stratford) 43.55; 3. Lauren Bigelow (Newtown) 43.61; 4. Emily Parchinski (Brookfield) 43.72; 5. Isabella Azar-Brandes (Pomperaug) 44.38; 6. Elise Barricelli (Newtown) 45.17. 3,200: 1. Brooke Morabito (New Milford) 11:20.56; 2. 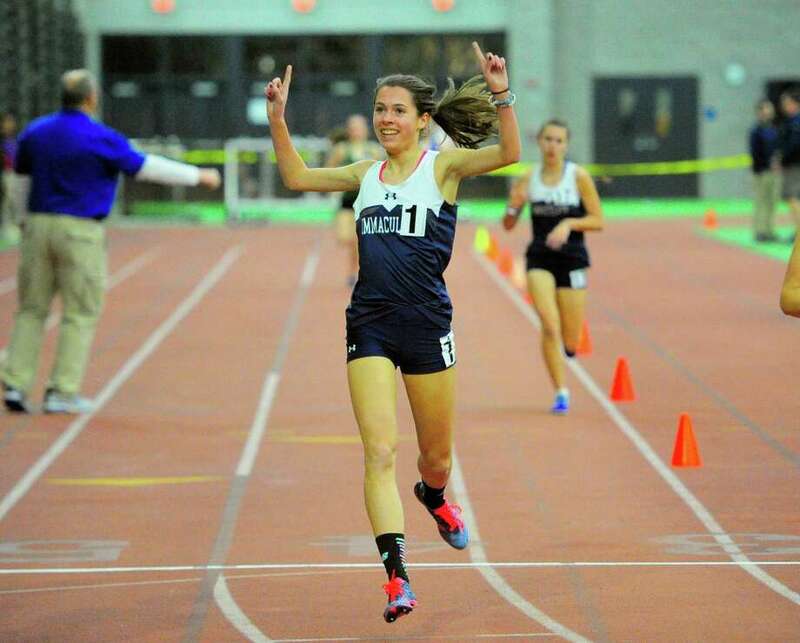 Taylor Mascetta (Immaculate) 11:34.14; 3. Kaitlyn Segreti (Immaculate) 11:35.18; 4. Hazel Hudson (New Fairfield) 11:41.55; 5. Ava Graham (Bethel) 11:47.42; 6. Juliet Bussell (Brookfield) 12:02.54. 4×400: 1. Weston (Nicole Sztachelski, Lauren Bigelow, Michelle Gutowski, Ava Zielinski) 4:12.87; 2. Masuk (Madison Kobza, Amanda Campos, Julianna Lindquist, Rachel Colegrove) 4:25.34; 3. Brookfield (Hailey Caraluzzi, Abigail Dell, Emily Parchinski, Taryn Terracino) 4:25.38; 4. Immacualte (Madison Flamme, Ailene Doherty, Maura Murphy, Eduarda Colares) 4:29.93. Pole vault: 1. Elise Russell (Weston) 11-00.00; 2. Katie Ryan (Newtown) 9-06.00; 3. Lucy Fine (Weston) 9-06.00; 4. Rachel Esslinger (Weston) 8-00.00; 5. Katie Matsuoka (Barlow) 7-06.00; 6. Evelyn Miano (Weston) 7-06.00. Shot put: 1. Kelsey Savoy (Pomperaug) 30-11.00; 2. Megan Mingey (Brookfield) 28-00.50; 3. Madeline Coco (Pomperaug) 27-09.00; 4. Lauren Rancourt (Masuk) 27-08.50; 5. Anna Burns (Newtown) 27-08.00; 6. Mariya Tazi (New Milford) 27-07.50. High jump: 1. Hannah Greene (Weston) 5-00.00; 2. Vassa Revaya (Bethel) 5-00.00; 3. Grace Stephens (Masuk) 4-10.00; 4. Elizabeth Murphy (Weston) 4-10.00; 5. Isabel Llach (Barlow) 4-08.00; 6. Katie Matsuoka (Barlow) 4-06.00. Long jump: 1. Mariella Schweitzer (Barlow) 16-10.00; 2. Abigail Williams (Bunnell) 16-03.50; 3. Emily Devorsetz (Brookfield) 15-06.00; 4. Samantha Pomeroy (New Fairfield) 15-04.75; 5. Chi Chi Anekwe (Stratford) 15-00.75; 6. Megan McFarland (Masuk) 14-09.25.